Seating up to 40 guests on round tables and up to 120 for an informal reception, the Masters Room is perfect for a small party, wedding ceremony or conference. A light and spacious room with a private bar and with access to outside balcony when hired in conjunction with The Box Room. Situated on the third floor in the period part of the hotel, The Masters Suite is comprised of three beautiful rooms giving it a versatile, light and spacious feel. 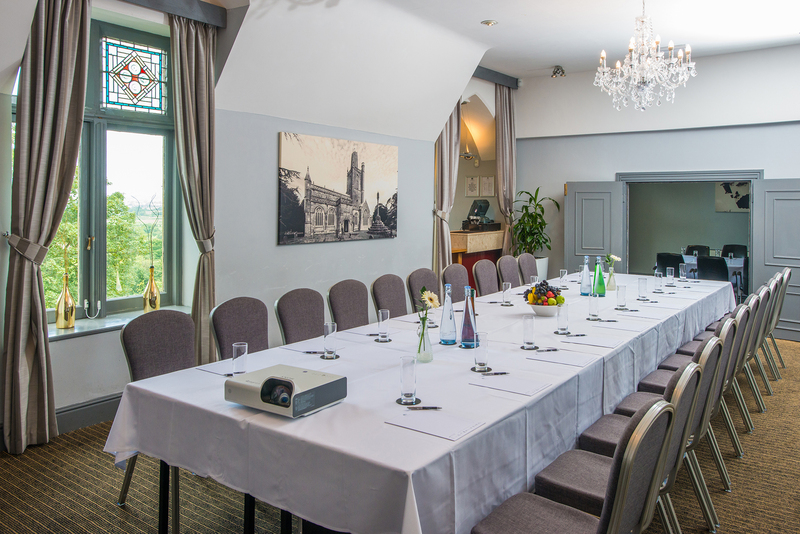 The Turret Room with a lovely Gothic bay window and great for meetings for up to 20 boardroom. The Masters Room, seating up to 50 Theatre style with stunning chandeliers and its own private bar. The Box Room with a capacity of 20 theatre style and stairs leading out onto a grassed balcony overlooking fantastic views of the surrounding countryside. Individually as The Masters Room or as a whole as the Masters Suite, it Is perfect for medium to small conferences, receptions, press launches, luncheons and dinners from 15 to 50 delegates.